"Orange Medal" token, awarded by Krinkle. 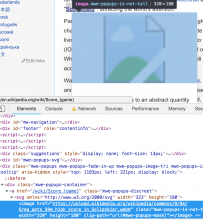 Visit https://en.wikipedia.beta.wmflabs.org/wiki/Category:Page_Previews and hover over "Test video hovers". A black box shows. Needs investigation to consistently reproduce. But we should check the PageImage extension doesn't use webm files as page images and blacklist if necessary. • Jdlrobson added subscribers: • Nikerabbit, MaxSem, Nemo_bis. ovasileva moved this task from Upcoming to 2016-17 Q4 on the Readers-Web-Backlog board. I disagree. We should measure how many pages are impacted by this issue. My guess is low. I'd argue an article with only a video in the lead would probably benefit from an image too. • Jdlrobson moved this task from Upcoming to 2017-18 Q1 on the Readers-Web-Backlog board. Not quite sure what "disagree" referred to exactly here. But it should be quite obvious that asking editors to replace the existing editorial choice (video still) with a different image means creating manual work that would be unnecessary if previews were able to handle that image format. I agree it may be worth measuring how many pages are affected, and if the number is very low, this solution (blacklisting webms and have editors replace the image) could be an acceptable tradeoff - but it would still be a tradeoff, requiring some amount of volunteer work to work around shortcomings of our code. @Jdlrobson, @ovasileva, is some further discussion with @Tbayer necessary to work on this task? Looks like this is still broken. 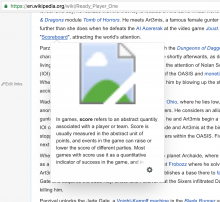 At https://en.wikipedia.org/wiki/Ready_Player_One#Plot, the link to Scoreboard is enhanced with a preview attempting to use a raw .webm file as target for <image href> inside an SVG. Aside from creating a broken thumbnail. It seems the API does provide a thumbnail, but the JS code is deciding to use the original instead of restricting to thumbnails. Not sure why. There shouldn't be any scenario in which a consumer should use an original directly on a page. But.. maybe the page summary API is breaking that, which would explain why Popups considers the originalimage? Maybe the bug summary should be rephrased: the issue is that page previews attempt to load something that is not suitable as thumbnail. Regardless, might be a good time to fix this anyhow. @ovasileva It likely depends on device pixel ratio. It only happens if dppx 2.0 or higher (aka "Retina" or "HiDPI") as otherwise Popups logic will probably use the thumbnail. See https://mydevice.io/ for example. Should we use a whitelist (.gif, .jpg, .png, ...) instead of a blacklist? We recently had an issue with previews using .ogv files which rendered as a similar broken image (it seems to work now though). Is there a problem preventing using still images from videos, specifically, or is there another reason y'all are trying to blacklist videos? And is it just videos or anything with extra parameters? Does this affect PDF, TIFF, and DjVu files with multiple pages, for instance, or SVG files rendered with a particular language? The most ideal solution here would be for editors to be able to set specific thumbnails for video at a certain frame point. Any ideas on how to do that? 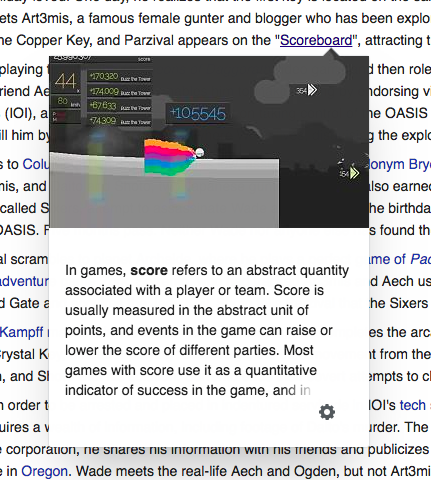 I'd love for us to not have to touch PageImages here. The thumbtime parameter only seems to apply in wiki it's used on, so ideally we'd need some way to define the default thumb within the file page. Do you have any sense of how difficult it would be to do that and how that could be done? I think that would be the perfect solution here. Provide a way to set a default thumb time that's used when no parameter provided, which would then get used when generating the thumbs from PageImages. Have PageImages save any non-size parameters used alongside the filename, store then in the page props, and re-apply them when running the transform. There's then the separate issue of whether the raw source file gets used in some circumstances, such as high devicePixelRatio? Let's revive T22647 for that discussion! Original suggestion was something like a keyword or parser function to be used on the File: page and saved into metadata of some sort. That probably works, though we need to make sure the default time gets exported across wikis for Commons (including via InstantCommons). The suggestions and ideas around video thumbnails sound good, but I think we're getting distracted from the original issue. Even if we have customisable video thumbnails, it won't solve the underlying issue. The issue is that Popups sometimes uses the original file instead of the thumbnail. This is a bug. It must not do that. The main problem described in this task is a video file being downloaded for an image element. This causes visible corruption (see F16907798), and needlessly consumes network/device resources. There are also likely other ways original files may cause problems such as with raw SVGs (MediaWiki intentionally does not display user-uploaded SVGs directly on pages), and (paged) TIFF files, 3D files, and more. The client should always a thumbnail provided by the API, or at least a url that is derived from the thumbnail url (Popups sometimes increases the width based on devicePixelRatio, which is fine). It should pick either the default thumbnail, a larger variant , or no thumbnail. That should be relatively easy to change. Alternatively, instead of the current client-side implementation, the Page Summary API could provide one or two extra thumb urls for common ratios. The MediaWiki imageinfo API that Page Summary uses already has a batching to facilitate this. MediaWiki does internally have a narrow set of scenarios in which it may expose a "thumbnailurl" fieldthat matches the original. (Mostly for JPEGs as optimisation, up for debate at T67383). Popups will already handle that transparently like a thumbnail. But its own code shouldn't consider the original. originalimage may not even need to be in the Page Summary API? The issue is that Popups sometimes uses the original file instead of the thumbnail. This is a bug. It must not do that. I'm not aware of this happening. Can you qualify what you mean by "sometimes"? I've never seen this happen so would like to reproduce as this sounds like another bug. We use the thumbnail from https://en.wikipedia.beta.wmflabs.org/api/rest_v1/page/summary/Test_video_hovers which comes from the mediawiki API. 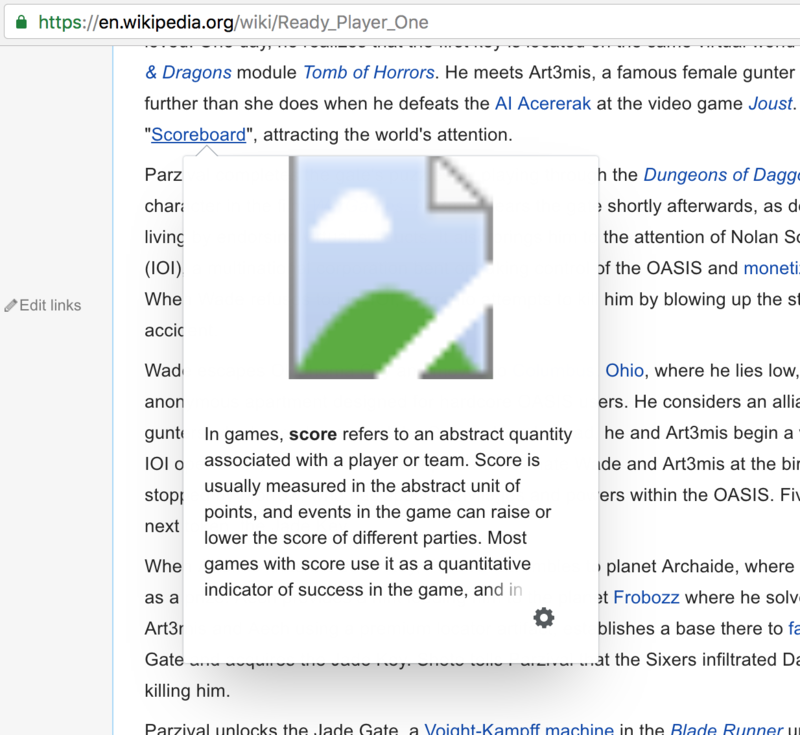 I think the line in question is here (although I don't have an example handy): https://gerrit.wikimedia.org/r/plugins/gitiles/mediawiki/extensions/Popups/+/master/src/gateway/rest.js#139. If that's turning thumbnails into videos, that's news to me. We should file a separate ticket with replication steps. "extract_html": "<p>In elementary algebra, <b>completing the square</b> is a technique for converting a quadratic polynomial of the form</p><dl><dd><span class=\"mwe-math-element\"><img src=\"https://wikimedia.org/api/rest_v1/media/math/render/svg/126c6935d3dd9f1c1da0c388ca2799be4f6f237c\" class=\"mwe-math-fallback-image-inline\" aria-hidden=\"true\" style=\"vertical-align:-0.505ex;width:12.629ex;height:2.843ex;\" /></span></dd></dl>"
I don't think this would be a good solution. First, it would create a lot of extra work for the editors who would have to transfer locally chosen thumbtimes to Commons as the default thumbtime, and update them there in case they are changed locally. I'm not sure it's true that it creates a lot of work. We've only seen 1 case in the wild so far where the page image has been the initial screen and the initial screen of that video was a black screen. The default of the first frame would continue to work without any editor intervention, but it would give editors an option to override that where necessary. Articles would continue to be able to use thumbtime as far as I'm concerned. We should probably move this discussion to T22647. Any how, this seems a lot better than blacklisting webm files altogether which was the original plan and what's suggested here...? I'm stalling this task until we've worked out whether T22647 is viable - let's talk about that there! Seems like T22647: Allow way to choose thumbnail frame for video on its File: description page is the way to move forward with this. Closing this. We've only seen 1 case in the wild so far where the page image has been the initial screen and the initial screen of that video was a black screen. Well, but that's a very narrow interpretation of the issue that this task should have resolved. 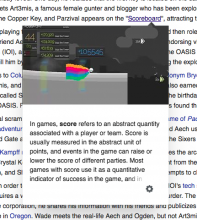 It is more appropriately described as "the initial screen is not a suitable page image". There are >1500 uses of the thumbtime parameter on enwiki alone. (And presumably this number will grow as ongoing and future multimedia efforts increase content and the adoption of the relatively young thumbtime parameter spreads.) While the video may not generate the PageImages image in all of these cases, it's clearly a more widespread problem. It doesn't solve the case described in T92457#4173454 (the same video used with two different thumbtimes in https://en.wikipedia.org/wiki/Narek_Hakhnazaryan and https://en.wikipedia.org/wiki/Fantasy_Pieces_for_Clarinet_and_Piano_(Schumann) ). Well, but that's a very narrow interpretation of the issue that this task should have resolved. Sure, but at least it provides an option for certain use cases. I also hope we'd agree this is better than blacklisting all webm files. I think this task was always a bit unhelpfully vague, so I've opened a more specific task at T197839. I'm not sure if it's feasible for us to fix it, as page images only captures the title of the associated page image and would likely need quite a large re-architecture to support that but we'll see. Right, that true of course.